The Skinny: Substandard for a Stephen Chow film, but still quite funny and amusing. In a return to the talky antics of Justice, My Foot! 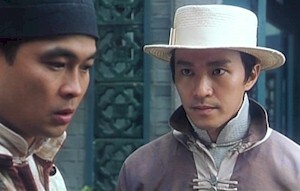 and Hail the Judge, Stephen Chow plays Chan Mong-Gut, a famous Chinese lawyer and merciless trickster back in 1899. When Chan Mong-Gut not busy doing lawyer-type things, he spends his time annoying the locals, fooling his daffy student Foon (Eric Kot), and embarrassing pretty women like Lotus (Chingmy Yau). However, Chan and Foon have a falling out when Foon takes off to the newly-ceded Hong Kong to impress Lotus. Unfortunately, he ends up getting framed for murder by Bowie Lam and Moses Chan Ho, who are out to snag an inheritance from their father (Chung King-Fai). Chan decides to leave China and defend Foon - in a British court. Aiding him is Karen Mok in a “flower-vase” role as Chan’s estranged wife, who was supposed to have studied law overseas, but actually studied fashion design. This puts Chan in a tough spot, especially when Foon appears doomed by the byzantine rules of British law.